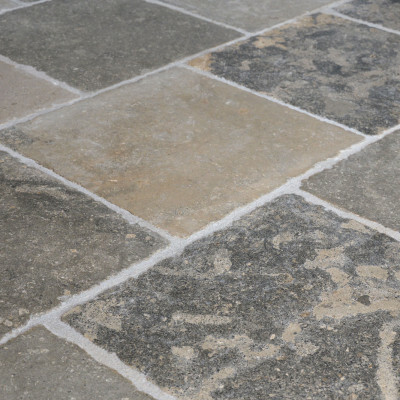 PUYGUILLEM - Antiqued natural stone paving (Dimensions available : 11 3/4 x 11 3/4 ; 15 3/4 x 15 3/4 ; 19 x 19 / Thickness: 2 cm). At the image of floors present in the fortress of Puyguillem in Dordogne. Interior paving.